It’s an overnight fundraising walk. It’s a way to remember and celebrate those lost to cancer and those who have survived it. It’s a great bonding experience to share with family and friends. And above all, it’s a way to fight back against the debilitating disease that affects so many individuals every day. I’m talking, of course, about Relay for Life. Boston University’s sixth annual Relay was held from 6 p.m. to 6 a.m. Saturday night at the Track and Tennis Center and was run by BU’s Colleges Against Cancer (CAC) chapter, with over 1,250 people in attendance. 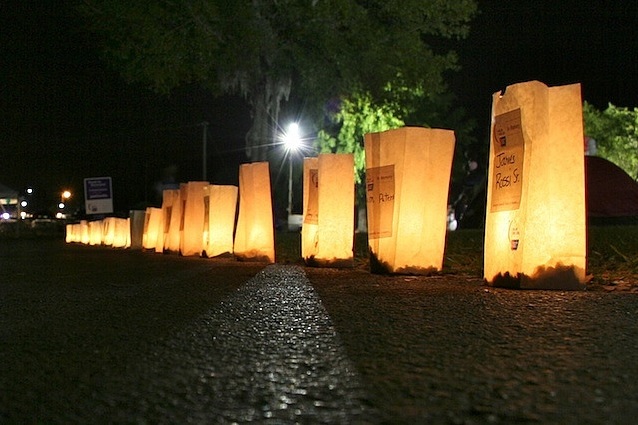 Relay for Life is a worldwide movement and annual event run by the American Cancer Society that more than 3.5 million people participate in and register for (in teams) each year. Over the course of 12 hours, members of each team take turns walking around a track, symbolizing the ongoing fight against cancer. Every participant helps make a change in the effort to rid the world of cancer, whether it’s by fundraising, participating in the actual event, or simply spreading awareness about the disease. I always wanted to participate in Relay for Life when I was in high school, but unfortunately I never got a chance. This year marked my second time joining my favorite student group’s Relay team. The most emotional and touching moment of the night, in my opinion, was the Luminaria Ceremony, where the Track and Tennis Center was slowly illuminated as people cracked glow sticks to honor those they knew who had lost their battles to cancer. Andrew Mullins, a senior in the College of Arts and Sciences, has been participating in Relay for Life since his freshman year of high school and has served on the CAC Committee that plans BU’s Relay all four years of his college career. Teams signed up for plenty of activities held throughout the night, some of which include a dodgeball tournament, Family Feud, Minute to Win It, and The Amazing Race. There was also a short Zumba session held at two a.m. to wake everyone up as the night progressed into the wee hours of the morning, along with a few speakers who were either survivors or had been affected by the disease who spoke about why they chose to relay and raise awareness about cancer. There might not be a cure for cancer yet, but one day there will be. To see such a large group of people come together for one cause only showed that together we are fighting cancer, one day at a time.